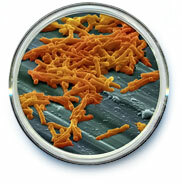 Clostridium spp are gram positive rod shaped bacteria that form spores (spores are extremely resistant structures that allow the organism to survive extreme environments). They can cause an extremely serious type of food poisoning called botulism (Cl.botulinum) found in tinned foods and thay can also cause serious wound infections such as tetanus. Another species causing illness is making the headlines recently as one of the bacteria that is building up resistance to antibiotics.